Edward O. Wilson—winner of two Pulitzer prizes, champion of biodiversity, and Faculty Emeritus at Harvard University—is arguably one of the most important thinkers of the twentieth century. Yet his celebrated career began not with an elite education but from an insatiable curiosity about the natural world and drive to explore its mysteries. Called “one of the finest scientific memoirs ever written” by the Los Angeles Times, Naturalist is a wise and personal account of Wilson’s growth as a scientist and the evolution of the fields he helped define. This 25th Anniversary Edition celebrates Naturalist as a modern classic. Wilson traces the trajectory of his life—from a childhood spent exploring the Gulf Coast of Alabama and Florida to life as a tenured professor at Harvard—detailing how his youthful fascination with nature blossomed into a lifelong calling. With humor and insight, Wilson recounts his days as a student at the University of Alabama and decades at Harvard University, where he has achieved renown as both teacher and researcher. As the narrative of Wilson's life unfolds, the reader is treated to an inside look at the origin and development of ideas that guide today's biological research. Theories that are now widely accepted in the scientific world were once untested hypotheses emerging from one man’s wide-ranging studies. At once practical and lyric, Naturalist provides fascinating insights into the making of a scientist, and a valuable look at some of the most thought-provoking ideas of our time. "What distinguishes Wilson's story is its handsome prose, honed by years of practice into a concise and sly discourse. Among literary scientists, no one since Rachel Carson has more effectively joined humble detail to a grand vision of life processes and structures." Over his long career, Edward O. Wilson has transformed our understanding of the natural world and human nature and provided an eloquent voice for the need to preserve and protect the biodiversity of our planet. Yet his celebrated career began not with an elite education but from an insatiable curiosity about the natural world and drive to explore its mysteries. 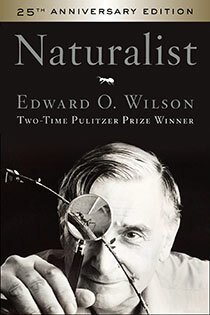 Naturalist is a wise and personal account of Wilson’s growth as a scientist and the evolution of the fields he helped define. As relevant today as when it was first published, Naturalist is a poignant reminder of the deeply human side of science and an inspiring call to celebrate the little things of the world. Check out Chapter 10 “The South Pacific” below, or download the PDF here.